after two years of priesthood, no one ever told me there'd be days like these! the NHL just had their draft last night. the rookies got a shirt + hat. i remember when i got my stole and chasuble - my ordination day was beautiful, filled with joy, a great and terrible day! i recently bought a new ball cap, as seen here, ... "P" for priest/prêtre! 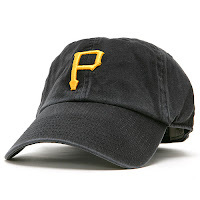 of course, this is a Pittsburgh Pirates ball cap, and having lived there for 1.5years, i have some feelings toward the team. of course, "P" could also stand for "pharisee", "pretender", or "pharisien". either way, we are called not to focus on issues, obstacles, or sin, but on our relationship with God in Our Lord Jesus Christ. but that is what hurts - sometimes we let these issues get in the way and ignore the only one that matters - life with God in JC! i've been listening to the recent journey of my brother priest, Fr. John Corapi, now simply John Corapi, on XM Radio Catholic Channel - Willit's morning show, Lino Rulli - the Catholic Guy show. after 20 years, Corapi has left active ministry, but apparently not the priesthood. i wonder how those hockey players feel when after the honeymoon? once friends on the same team, some become enemies because they now play on different teams. once friends due to playing on the same team, can't remember the guy's name because he has left the team. friendship is such a peculiar thing, and yet there is nothing more beautiful than when you have found a good friend. after ordination i lost touch with some of my classmates. indeed, long distance relationships are difficult, eh? however, these issues are nothing compared to the hurt that one feels when a brother priest leaves active ministry and priesthood - after 5, 10, 15, 25, even 50 years of priestly ordination! nobody told me there would be days like these. strange days indeed. these strange events, our brothers remind us to keep our eyes not on man but on God in Our Lord Jesus Christ! let us pray for Corapi, and all of us as we continue our journey of holiness, our journey to know, love, and follow God in JC!. as we celebrated la St-Jean yesterday, the Solemnity of St-John-the-Baptist, patron for all French Canadians, we echo his words of wisdom, "He must increase, i must decrease."